Ohio is part of PJM, the regional grid operator for all or part of 13 states. 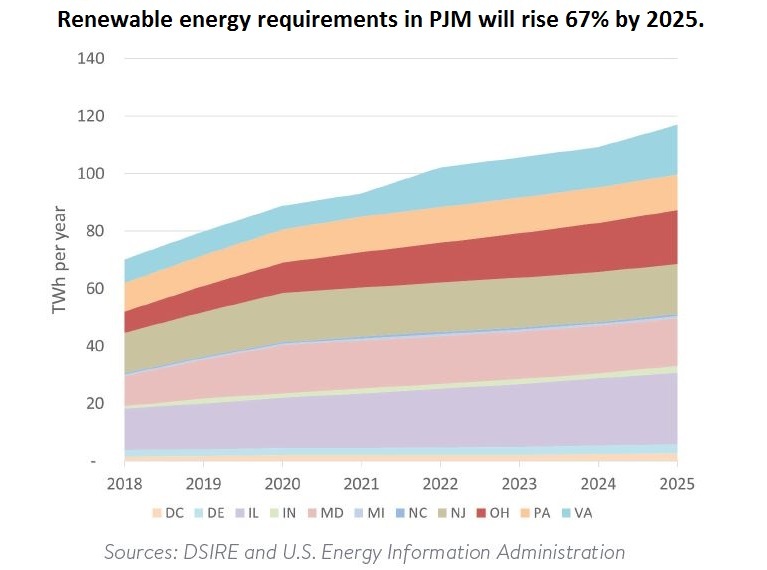 Eleven of these (including Ohio) have state requirements for a minimum amount of renewable energy and, under the current laws, these requirements will be 67 percent higher across PJM in 2025 than today. 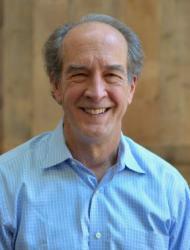 How are these states going to get all of that renewable energy? As the regional market continues to grow, Ohio can capture both investment and economic growth by building wind and solar facilities, providing itself and other PJM states with clean electricity. Based on modeling, the report finds that Ohio could build 3 gigawatts of wind and 2.2 gigawatts of distributed and utility-scale solar by 2030 – enough to power more than 1.1 million Ohio homes, or nearly a quarter of the state’s total households. These potential projects represent multibillion-dollar investment opportunities that would create jobs and income, particularly in Ohio’s rural areas, with total growth potential predicted to be more than 5,500 jobs and $2 billion in annual GDP. With its strong manufacturing foundation, Ohio can also supply the equipment needed to build these wind and solar facilities. That’s because wind and solar construction depend on manufacturing industries in which Ohio excels—steel, fiberglass, machinery, glass. Ohio’s firms and workforce are already well positioned to contribute and even lead in these areas. According to the American Wind Energy Association, Ohio has 60 manufacturing facilities that supply or have supplied materials to the wind supply chain – more than any other state. For example, Owens Corning has an R&D facility in Granville, OH, focused on fiberglass composites that strengthen turbine blades. Unfortunately, state legislators have consistently tried to gut Ohio’s renewable energy standards, creating policy uncertainty and limiting the state’s potential to capitalize on this enormous opportunity. In fact, in just the past few months, many state leaders have tried to get destructive legislation – House Bill 114 – off the ground, despite the support voters have demonstrated for clean electricity. Ohio should not only build wind and solar to power Ohio homes and businesses, it should also lead on manufacturing the parts needed for other states and businesses to build their own facilities. Doing so would help limit harmful pollution from traditional fossil-fuel electricity sources and create jobs, while bringing in billions of investment dollars – and giving Ohioans what they want. 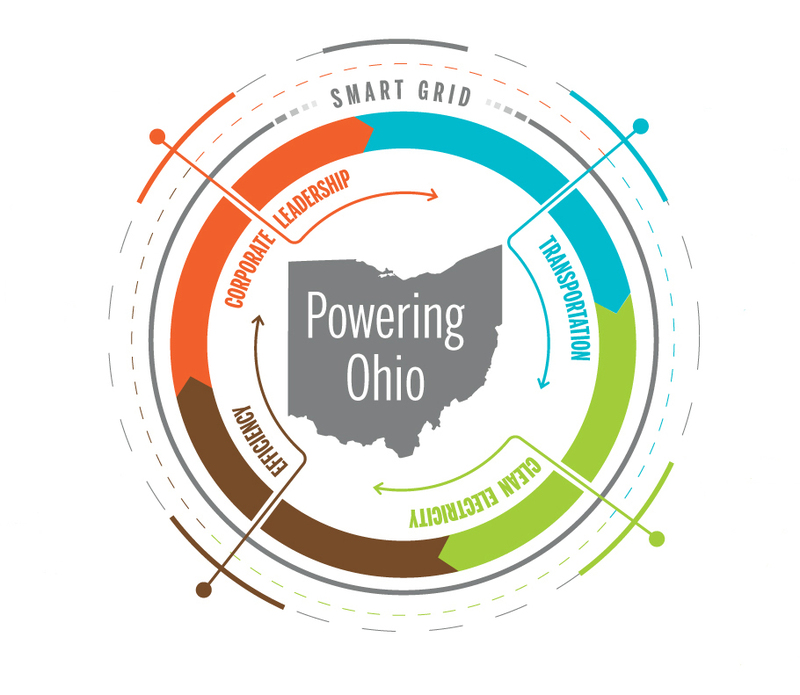 This is the third in a series about the Powering Ohio vision report. You can read my first post about why Ohio is well positioned and my second post on transforming the transportation sector.